Welcome to Rupert United Methodist Church! Nestled in the heart of Rupert, Vermont, Rupert United Methodist Church offers a sanctuary from life's struggle. Here we worship, study, fellowship, care for each other, and seek to find our way as disciples of a living Christ. Every church, from the largest metropolitan megachurch, to a small rural church like Rupert United Methodist, has the same mission, and the same challenge: How, in an increasingly secular world, do we spread God's word and bring people into closer relationship with God? We believe the secret is not a secret at all. We do it by striving to live Jesus' summary of the entire scripture: "Love the Lord your God with all your heart and all your soul and all your mind." and "Love your neighbor as your self." We strive to do this as a church family that is always open to new people, or returning members. We invite you to join us, whether for a single service while visiting Southwest Vermont, or regularly as part of our church family. We are not a perfect people, so you don't have to be perfect either. Come as you are. Bring your burdens, hopes, and energy. Share your faith journey, and let us be part of yours. 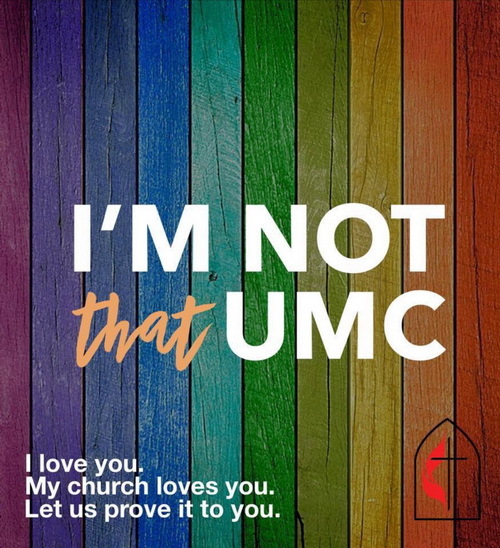 Want to know where we stand on the larger UMC vote about the place of LGBTQ+ people in the church? The image to the left may give you a clue. Want to know more, including how we came to this place biblically? Watch this synopsis of the sermon Pastor Tom Atkins preached the day after the decision.